Eating a 600-calorie breakfast rich in carbohydrates and protein helps dieters lose more weight long term than eating a modest breakfast and following a lower-carb eating plan, according to a new study. Breakfast and weight loss have long been linked, but the new research zeroes in on how to help dieters stick with a plan and not regain the lost weight by adjusting the amount of carbohydrates, protein, and calories eaten early in the day. "Those on the 'big breakfast diet' feel less hungry before lunch and all day," says Daniela Jakubowicz, MD, an endocrinologist in Caracas, Venezuela, and a clinical professor at Virginia Commonwealth University in Richmond, who led the study. She is presenting her findings this week at ENDO 08, the 90th annual meeting of The Endocrine Society in San Francisco. The low-carb diet group of 46 women was instructed to eat a small breakfast totaling about 290 calories that was low in carbohydrates and typically didn't include bread. A sample breakfast might have included a cup of milk, one egg, three slices of bacon, and two teaspoons of butter. When they visited the study center, these women ate breakfast there and their food was monitored. They ate an average of 1,085 calories a day. The big-breakfast group of 48 women was told to eat a breakfast of about 610 calories. A sample breakfast: a cup of milk, turkey, cheese, two slices of bread, mayonnaise, 1 ounce of chocolate candy, and a protein shake. They could eat the breakfast in stages from the time they got up until 9 a.m. This group averaged 1,240 calories a day. Both groups stayed on the diet for four months to lose weight, and then shifted to maintenance mode for the last four months. At the four-month mark, the dieters eating the modest breakfast dropped about 28 pounds, while those on the big breakfast plan lost 23 pounds. The real differences showed up at the eight-month mark, when the low-carb dieters had regained an average of 18 pounds and the big-breakfast eaters continued to lose, dropping another 16.5 pounds on average. 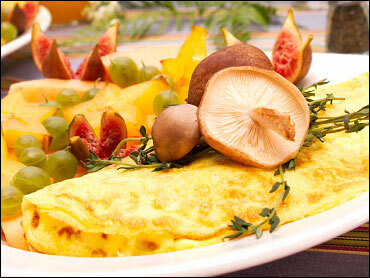 In all, members of the big-breakfast group lost more than 21% of their body weight; low-carb group members lost 4.5%. A bonus, says Jakubowicz, is that the big-breakfast dieters reported less hunger and fewer cravings for carbohydrates than the other group. Some of the study findings make perfect sense and are well known to nutrition experts, says Joan Salge Blake, RD, a spokeswoman for the American Dietetic Association and a professor of nutrition at Boston University, who reviewed the study for WebMD. "We know women who don't eat breakfast are more likely to do impulsive, unplanned snacking," she says. "It's no big surprise that having breakfast and having protein is a good thing when it comes to weight loss." "We know protein will have the biggest effect on the feeling of fullness," she says. "It's always important to have protein at each meal." But she has some misgivings about both diets, contending that the daily calorie allotment and the carbohydrate intake was too low in both groups. "One hundred thirty grams of carbohydrate are the minimum for our brain to keep working," she says, citing guidelines from the National Academy of Sciences. To achieve weight loss, she advises eating breakfast every day, including protein at each meal, and also focusing on eating fruits, vegetables, and whole grains. While the participants in the study were all obese, Jakubowicz says she thinks the plan will work for those with less weight to lose, too. "I think this is the right way of eating, even if you are thin. I think it works for everybody and especially for obesity."